While the rest of Europe was working through the famous Industrial Revolution, Russia continued to work in more crude forms of agricultural techniques. After the failure of the Crimean War, Russia’s regime received a wake-up call and attempted to industrialize the country that “still imported 70 per cent of all machinery and relied heavily upon outmoded technology” (Freeze, 216). Unfortunately for Russia, “industrialization . . . had been so retarded and even discouraged by the pre-reform regime, [that it] faced considerable obstacles” once they attempted to industrialize (Freeze, 215). Russia’s attempt to industrialize made a significant impact on small and large areas of Russian politics and society. The attempt at industrialization by the regime even had a significant impact on Russia’s tea trade and culture. The consumption of tea in Russia has long been a part of its history since the 17th century and continues to be a part of the culture today. A Los Angeles Times article, “Slaves of Tea,” describes the strong tea culture in Russia by expressing the “tea drunkenness” and consumption of cheap tea by the Russian workingman. This article also describes the “fine taste” of tea in the Russian upper classes and that “no respectable household in Russia [is] without one or more ‘samovars.’” This article reveals the strength of tea culture in Russia and its importance in Russian culture. Russian tea was often imported from China by means of camel caravans. The trade with China that provided much of the tea in Russia continued from the 17th century into the mid-19th century. However, the camel caravan means of tea trade began to decline around the time the first leg of the Trans-Siberian was put into use in 1880. This product of industrialization in Russia caused a shift in how tea was supplied to the country. However, it did not necessarily increase tea trade with China or other important regions. In fact, the result was quite the opposite. Four years after the first leg of the Trans-Siberian Railway was established, a New York Times article, “Tea Grown on the Black Sea,” describes the determination of the Russians to forego reliance on imported tea as “the tea plant has lately been introduced near Soukgoum Kaleh, on the Black Sea, and the Russians are confident, it seems, that they will be able to do without either Chinese or Indian teas.” Similarly, a short newspaper article, “Tea Culture in the Caucasus,” reveals the plan of tea merchants to establish tea plantations “along the Circassian coast.” Also, the merchants sent Russian experts to China “to study the tea culture” so that the region could provide a good tea staple for the country. The picture of the tea weighing station above was taken in Chakva. Chakva was a tea farm near the Black Sea and supplied large amounts of tea throughout Russia. This picture continues to show the how merchants focused more on growing and dispersing tea within Russia. 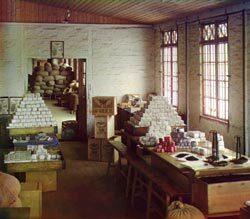 The tenacity of the Russians to grow and disperse their own tea throughout the region reveals some of the obstacles and resistance by the Russians to industrialize as some tea merchants seemed to try to curl themselves and tea culture within Russia’s border lines. The impact of Russia’s attempt to industrialize resulted in obstacles and opposition by many. The change in tea trade in Russia from a culture that largely imported their tea by camels to one that grew and dispersed their own tea within the country was an impact of Russia’s many attempts to industrialize. In the late 19th century, Russian industrialization did not greatly increase trade, but caused Russia to attempt to limit tea and tea trade to themselves. “Russian Tea Culture.” Wikipedia. Accessed August 31, 2014. http://en.wikipedia.org/wiki/Russian_tea_culture. “Tea Culture in the Caucuses.” New York Times (1857-1922), Dec 25, 1887. http://ezproxy.lib.vt.edu:8080/login?url=http://search.proquest.com/docview/94490489?accountid=14826. “Slaves of Tea.” Los Angeles Times (1886-1922), Oct 15, 1899. http://ezproxy.lib.vt.edu:8080/login?url=http://search.proquest.com/docview/163980905?accountid=14826. “Tea Grown on the Black Sea.” New York Times (1857-1922), Aug 04, 1884. http://ezproxy.lib.vt.edu:8080/login?url=http://search.proquest.com/docview/94267431?accountid=14826. Prokudin-Gorskii, Sergei Mikhailovich. Weighing Section. ca. 1907-1915. Digital color rendering. Prints and Photographs Division, Library of Congress, LC-DIG-ppmsc-03992 (26). http://www.loc.gov/exhibits/empire/work.html. I love how you examine the economic back story of tea culture in the late imperial period! Nicholas II approved the construction of the Trans-Siberian for military purposes (thinking it would be easier to move troops quickly across the empire), but the economic and cultural shifts it helped facilitate were also incredibly important. It’s interesting that the Russian efforts to establish a “domestic market” focused on the Caucasus (in this case Georgia), and that the new railway didn’t just make it cheaper and easier to move the imported stuff. You found some terrific newspaper articles to add depth to this post. Nicely done! I didn’t know that tea had been industrialized in Russia to that extent. I thought that “tea drunkenness” in Russia was more referring to the vodka that they put in their tea, but i guess not. I also didn’t know that Russian had such a homegrown tea industry. Did you come across any information about what type of teas that they made? Or whether their tea industry ever rivaled China or India? Did they ever export their teas or was it just for Russian purchase? The term “tea drunkenness” can give one the wrong idea as to what it actually means. The tea that was drunk by the Russian workingman was known as brick tea and the Los Angeles Times article, “Slaves of Tea,” used in my post describes how workingmen would drink about “twenty stakans (or tumblers) a day.” This shows how much tea the Russian workingman consumed, so “tea drunkenness” is aptly named in my opinion! I have not yet been able to find the types of tea that were grown in Russia from my primary sources, but in the New York Times article “Tea Culture in the Caucases,” it describes how the merchants sent men to study Chinese tea. This information combined with results from the Wikipedia page, “Russian tea culture,” which reveals black tea is the most common form of tea in Russia, allows one to speculate that the Russians most likely grew black tea similar to that of Chinese black tea. All the sources that I have come across seem to reveal that Russia’s tea industry remained within the borders for the Russian empire. This does not mean that Russia cut off their imports of tea, for the Wikipedia page, “Russian tea culture,” describes how despite the decline in tea trade with China, there was still imports of tea from London and Odessa. Nevertheless, the attempt of the regime to industrialize and add in the new railway changed the culture and industry of tea for Russia. I also never knew the extent to which Russia was involved in the tea industry. It is interesting that they chose to go that route and follow in China and India’s footsteps rather than industrialize when the Western world was doing so. Like you said, they definitely hurt themselves by trying to rely solely on themselves for a tea industry instead trying to industrialize. Thank you. I was just curious and I didn’t know that Russia made its own tea. Such an interesting topic. I like how you analyzed the relationship of this cultural tradition and economic product, resulting an a national effort to advance their own tea trade. I found this post to be very enlightening to a person who is completely ignorant about tea. You did a very good job of transitioning the article to the near reliance on other nations for tea to how Russia tried to industrialize and create their own tea. I was also surprised their was such extensive camel trade in northeastern Russia! To be honest I didn’t know camels were anywhere besides Africa and in the Middle East. Thanks for posting this, and ill be looking forward to your next posts. Another interesting connection is the evolution of a tea-drinking culture in industrializing nations because caffeine increases the productivity of workers. The tea “addiction” in Britain was one of the major effects of industrialization, but it also led to a big trade disparity between them and China since they were importing all of that tea. In that way, Russia was really acting to protect themselves by beginning to grow their own tea, which you did point out. Really great post!